This is one of those dishes that’s surprisingly quick, but tends to be very impressive when it hits the table. I can easily get this from “glimmer of an idea” to “meal on the table” in forty minutes – even less if I get the vegetables prepped in advance. It makes the whole house smell tremendous, it’s very flexible for guests, and it’s not too expensive, either. Fajitas. Mmm. 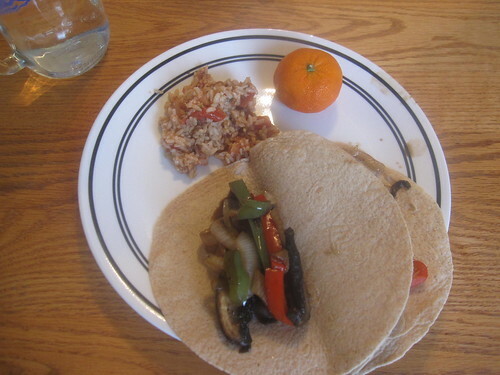 Sauteed vegetables, well spiced, in tortilla shells, with some rice on the side. There are similar fajita recipes all over the internet and in tons of cookbooks. I’ve been making them for so long that I’m not even sure where the original idea came from. Most of the ingredients here are things you’ll already find in your kitchen if you’re appropriately well-stocked. For fresh vegetables, all you need are two large garlic cloves, one yellow onion, two bell peppers (your choice of color), and two portobello mushrooms. This ran me $4.60 at the grocery store. You’ll also need a dozen tortillas ($1.89), two tablespoons olive oil, two teaspoons ground cumin, one teaspoon chile powder, sea salt and black pepper to taste, 1 tablespoon soy sauce, some thinly-sliced lettuce ($0.99 for a head, which was more than plenty), and one cup diced tomato ($0.69). 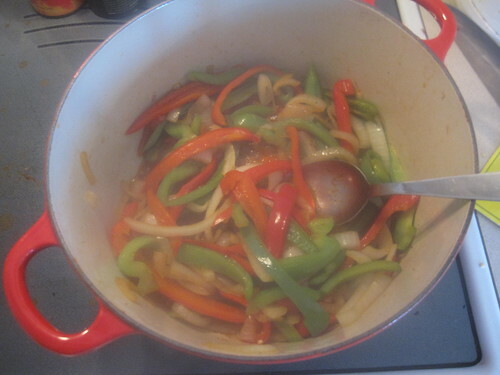 This will make about ten fat fajitas, which is plenty to serve four or five adults. We can serve two adults and two children twice with this batch. Our total cost was about $7, though in our batch we used a few more peppers simply because we split the meal into two batches, one with peppers and one without. This actually left us with a small mountain of leftovers. 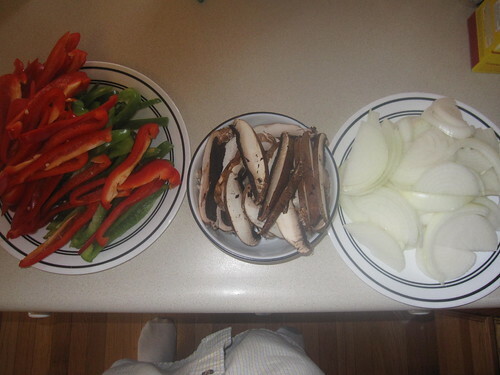 The big thing you can do in advance for this meal is to simply prep the fresh vegetables. Slice the onion into half circles. Seed the bell peppers and cut them into half-inch strips. Cut the portobello mushrooms into half inch strips. When these are prepped, store them in containers in the fridge until you’re ready to make the meal. 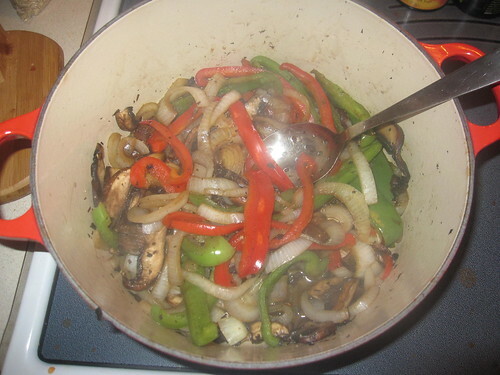 Fire up a large skillet, then add the olive oil, onion, bell peppers, and mushrooms over medium heat for about five minutes. While this is cooking, press the two garlic cloves right into the skillet. If you don’t have a garlic press, you can just mince the garlic. Stir the vegetables occasionally during this five minutes, then add the cumin, chile powder, salt, pepper, and soy sauce and cook for an additional seven minutes or until the vegetables are soft, again stirring regularly. 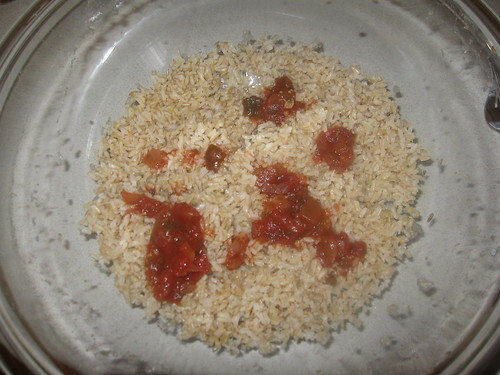 On the side, we served a bit of what we call “poor man’s Spanish rice,” which is essentially cooked rice with some salsa mixed in. Serve the vegetable mix along with the tortillas and shredded lettuce and let everyone assemble their own fajitas bonitas! The best part? The aromas of all of this just fills your house. The easiest option is to simply add some meat to the vegetable mix. You can start by simply putting the olive oil into the skillet with the meat, then thoroughly cooking the meat before adding the vegetables and, eventually, the spices. This is actually how I used to make fajitas until I changed diets. I mostly just amped up the mushrooms as a replacement.